In an April 2016 letter to PAX, Poongsan stated it has been involved in producing “a self-propelled 155mm howitzer weapon that includes cluster munitions” for the Korean government. The company stated it has ceased the production of the K305 and K308. [vii] Poongsan did not reply to follow-up questions about when the production of the K305 and K308 was ceased, or whether the 155mm howitzer weapon that includes cluster munitions it refers to is the K310 or another type. Regardless of the exact current status of Poongsan’s involvement with its K305 and K308 cluster munitions, it is clear that Poongsan still advertised its K310 cluster munition in 2017, which is after the latest information received from the company. 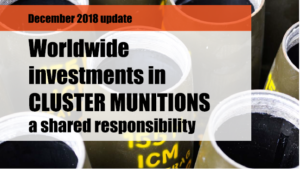 Poongsan is considered a cluster munitions producer because there is sufficient evidence that it has been involved in the production of several types of cluster munitions since 2008, notably the K305, K308 and K310. Although Poongsan wrote to PAX in 2016 that it had stopped producing the K305 and K308, the company did refute that it produced the K310, did not state publicly that it would stop producing cluster munitions and still advertised the K310 in 2017. [i] Poongsan Corporation, “General Information”, Poongsan Corporation website (www.poongsan.co.kr/eng/about-poongsan/general-information/), last viewed 28 March 2018. [ii] Poongsan Corporation, “Ammunition & Explosives”, September 2008, available at www.poongsan.co.kr/kor/common/download.php?downpath=/kor/menu2&downfile=Poongsan_catalog_kor.pdf, last viewed 28 March 2018; Council on Ethics for the Government Pension Fund – Global, “Recommendation of 6 September 2006”, 6 September 2006, available at www.regjeringen.no/en/dokumenter/recommendation-of-6-september-2006x/id449053/#note2, last viewed 28 March 2018. [iii] Jane’s Defence Industry, “South Korea’s Poongsan helps Pakistan manufacture ammunition”, 23 November 2006. [iv] Poongsan – POF Joint Venture, seen at DSA 2008, on file with Omega research Foundation. [v] Poongsan Catalogue, Ammunition and Explosives, seen at IDEX 2013, on file with Omega research Foundation. [vi] Poongsan Catalogue, Ammunition and Explosives, seen at BIDEC 2017, on file with Omega research Foundation. [vii] Poongsan, written communication to PAX dated 25 April 2016.